I know that I haven’t posted in some time. The world got crazy, but I had committed to getting back to baking and blogging at the start of the year. And then I cut my hand. (I was cleaning the food processor, but that’s a long story). It wasn’t severe, but it make food prep a little more complicated and it turned typing into a frustrating game. But the Decadent Vegan Baker is back and ready for action. So, without any further ado, I bring you this week’s vegan, high-altitude baking experiment. Okay, this one wasn’t very difficult. 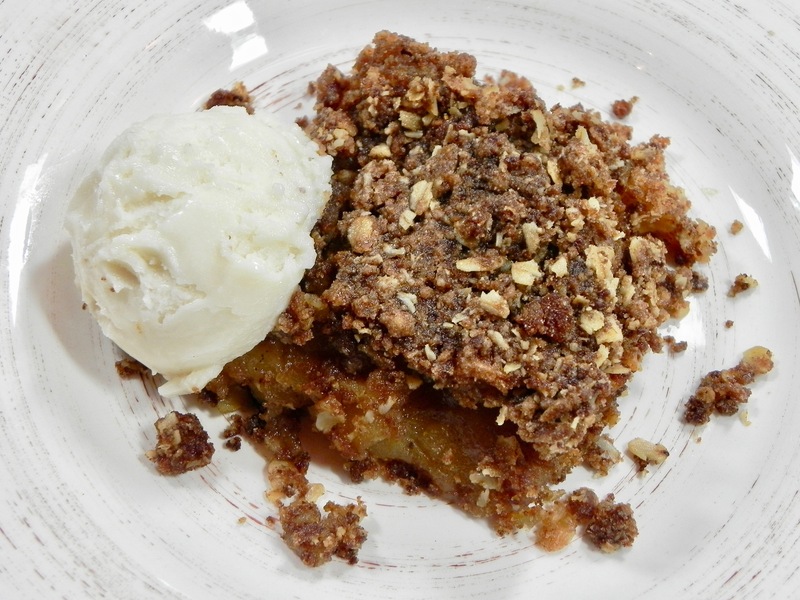 I decided to ease into things with an apple crisp. Generally apple crisps pop up in autumn, but where I live the weather is warm, then cold, then warm again, so it felt appropriate. The tweaks I made were to follow my personal desires, which I inspire any baker to do. Crisps are a good backdrop for making changes because they don’t involve the scientific perfection of something like a cake. I added ginger to give the crisp a spicy zip. I also chose coconut sugar as the sweetener to change the flavor profile a bit, and because my brown sugar had become a doorstop. You can use gluten free flour instead of the all purpose flour if you prefer. If baking gluten free, then look for gluten free oats. Preheat oven to 375F. In a large bowl, mix apples, ginger, vegan sugar, lemon juice, 2 TBS flour, and 3/4 tsp cinnamon. Place in a 9 x 13” glass baking dish. In a medium bowl, combine 3/4 cup flour, oats, cinnamon and brown sugar and stir. Add margarine and cut in with two forks until combined. Don’t worry; it will still be lumpy. Spread topping over filling. Bake for 25-30 minutes, uncovered, until topping turns golden brown. Let cool and then serve. I topped mine with vegan vanilla ice cream. Note: You can halve the recipe and bake it in an 8 x 8” baking pan for the same amount of time as listed in the recipe.